The water lilies are pruned once each season, which allows new growth more space as well as more flowers to bloom. It also ensures our interns a chance to navigate the pond in a traditionally constructed coracle. Busy as bees, we were, in the Delphi gardens last week! Cooperating and focusing, we finished installing the "tomato wall," pruned and deadheaded the Europeana roses to make way for their second flush of summer growth and, yes, even more clusters of red flowers..
We also made some necessary headway with the apple and pear cordon summer pruning process, scythed stalks of golden White Sonora wheat down and prepared it for curing, and picked so many cherries and berries: delightful! The tomato plants are growing quickly thanks to the little heat waves we've been experiencing. The fence is in place for us to tie stems to once they get a bit more mature. Training and pruning tomatoes against a wall, or fence, is one of my favorite summer activities. This season, we will grow tomato plants in two different ways in order to compare fruit and plant health, as well as the labor requirements necessary, hopefully informing us about whether the inputs involved in training and pruning are, ultimately, "worth it." We will train and prune our heirloom, indeterminate varieties alongside the fence we constructed (it's about 30 feet long, 6.5 feet tall, and will support 25 plants) and we will use tall, swirling metal posts for our Goldrush Currant plants, and other indeterminate varieties, in a separate bed. I have to be upfront about my bias, which is, of course, already clear -- although I am really excited to draw some comparisons and look more analytically at these two different systems for growing tomato vines. I learned about the intensive training method while apprenticing at Live Power Community Farm, and was so smitten with the process that I even volunteered, in addition to working very long days, to keep up with the tying and training on my own time. The intimacy that one is able to develop with the plants and, therefore, the education one receives from them - about their growth patterns, habits, and more - was irreplaceable. The rhythm of this activity, taking time for it mid-summer despite the busy-ness of everything, seemed vitally important. It really took all of us to properly install the "fence" that we'll be growing the indeterminate vines against: I am very grateful to José, our fellow gardener and maintenance person, for assisting with its design and construction. The plants were placed about 18 inches from one another, diagonally, on either side of the sturdy fence, which is simply reclaimed 6x6 wire mesh, held into wooden posts with screws and washers. It was designed to be able to take down, and assemble, easily, and to be tucked into storage in a compact way when necessary. The training process is quite simple: to grow the best tasting fruit in the most organized, space-saving way, you must allow for light and air to enter the canopy, so pruning out extra foliage, in the form of "suckers," after choosing one, two or three main stalks, is the general gist of this process. I typically like to have two main stalks identified and trained: just in case something happens to the other. Suckers emerge from the stalk and stem at 45 degree angles, and will simply develop into "stems," complete with foliage and fruit bracts, themselves. The fruit bracts grow out from the stalk with, typically, three sets of leaf stems in between each bract. I like to prune the suckers off when they are smaller than 4" long, to prevent any tears in the main stalk, and they simply break off when you move it forward and back in a quick, gentle motion. 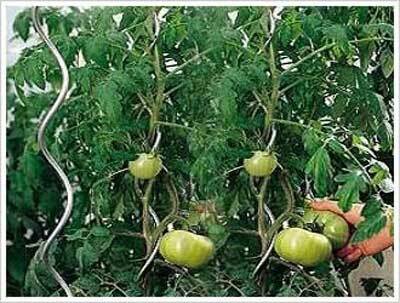 I like to tie the plants to the fence lightly, just above the fruit bract, to support the fruit that we hope will get heavy below. Here is a photo of my farmer-mentor, Stephen Decater, working in the tomato wall at Live Power Community Farm, in Covelo, CA, July 2010. Stephen was a student of Alan Chadwick's and learned this training and pruning method from him, directly.